If you are attempting to take the survey, you have taken a wrong turn. Click here. If you are thinking about signing your church up but still browsing, perhaps you ended up here looking for PRICING INFO or an opportunity to PREVIEW THE SURVEY QUESTIONS? If you are ready to sign up now, please fill out the form below and have your credit card handy for the final step. Please be assured we will treat your email address with privacy and protection. Leadership Transformations does not share or sell email lists. Your information is safe with us. The username(s) listed are already in use. Please change the suggested username and then click the "Check Availability" button to see if that Username is available. You will not be able to proceed with your signup until you have selected unique usernames. Feel free to edit/shorten the suggested username and then click the "Check Availability" button to see if that Username is available. Each survey participant will see the following greeting and brief instructions prior to beginning the survey. Please take a moment to personalize the message (you may add/edit as you like). Welcome! Thank you for taking the time to participate in this survey. The first step in assessing the health of our church is to get an honest appraisal of where we currently stand. As a result, we'll know where we need to apply intentional focus and openness to God's continued shaping of our ministry. Please try to answer each question candidly and honestly. Your first reaction is usually best so try to move swiftly through the assessment without bogging down and over-analyzing your responses. This should take approximately 25 minutes to complete. Be assured that your responses will be kept strictly confidential and at no point will your name be associated with your responses and/or remarks. With your help, we can identify our strengths as well as our soft spots and pursue all that God has intended for our church. IMPORTANT: Do not use the browser's BACK button during the survey. Doing so may lock up your computer. Release of Data for Aggregated Research Your church's data will be combined into an international aggregate database of all churches that have participated in the assessment process. This database enables us to study macro level trends in denominations, generational categories, geographic regions, etc. All data will be kept strictly confidential. At no point will your individual churches data be singled out or made available to the public. We do not sell or share our mailing list. You must accept the terms of the Release of Data in order to continue. 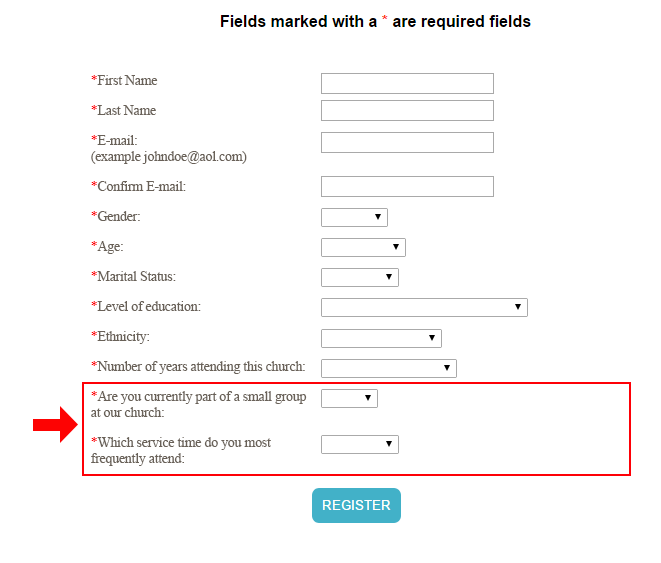 The Custom Questions Module (CQM) will allow you to add additional questions at the end of the CHAT survey (standard question set cannot be altered) which you can tailor to your church's specific scenario. The CQM allows you to add up to 10 questions in either multiple choice ("choose one" out of up to 5 choices, view sample) or 1-5 scale format (view sample), plus one open-ended question (view sample). You can also create 2 demographics questions (view sample) and run sub reports to compare demographic groups (i.e. "Which service do you typically attend?" will allow you to compare the survey results by service time). This is a powerful and insightful add-on. You can formulate your custom questions later. You do not have to have them ready at this time. (Baker, 2003) by Rev. Dr. Stephen A. Macchia. Becoming a Healthy Church fully unpacks the 10 Traits of a Healthy Church that CHAT uses as the assessment grid. We highly recommend reading through this material with your team or governing board as you go through the CHAT process or leading up to it. You'll greatly benefit from having a deeper understanding of this material and you may even consider building a sermon series around these characteristics in order to stimulate thinking and dialogue in the congregation as well. "If you have your health, you have everything: the old axiom about our bodies is equally true of our churches. Macchia goes straight to the heart of what churches need and can do to survive and thrive in the twenty-first century." - Leith Anderson, Wooddale Church. Picture the potential of these demographics questions: When you get the CHAT report by email it will be formatted by default to compare the leadership responses to the congregation responses. In the appendix of the report, you'll be able to kick off additional sub-reports which break the data down by ANY demographics question. So the pastor using the above deomographics questions will have the ability to break down the CHAT data for a question-by-question comparison of those who are in a small group and those who are not. And a separate report comparing the 9:15 attendees' responses to the 11:15. CHAT already includes the standard demographics of Age, Gender, Marital Status, Years at Our Church, Education, and Ethnicity – and you'll be able to run comparison reports based on any of those variables as well!